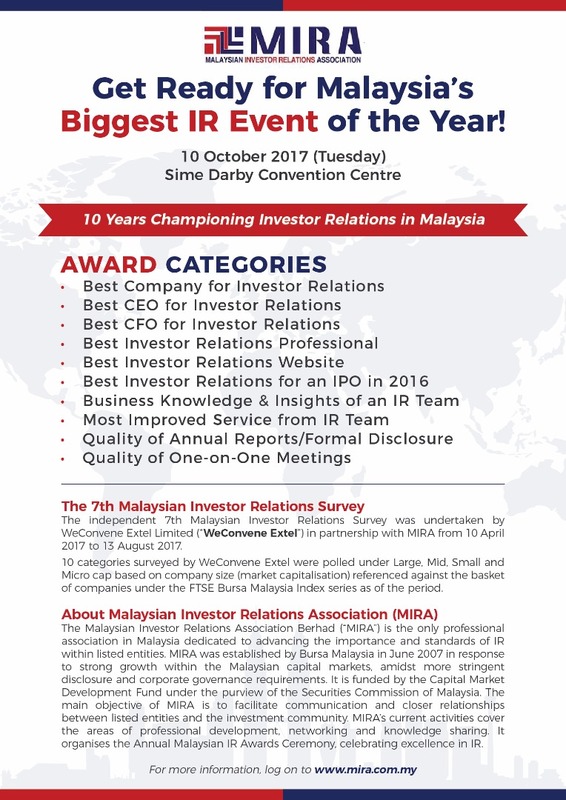 The Investor Relations Awards 2017 (IR Awards) is the largest annual event in the Malaysian Investor Relations Association (MIRA)'s calendar. For the seventh consecutive year, MIRA is proud to host the IR Awards, which marks the culmination of a dedicated initiative by the Association in advancing and promoting good IR practices among listed entities in Malaysia. The awards will be presented at a luncheon which will be held on Tuesday, 10 October 2017 at Level 1, Ballrooms 1 & 2, Sime Darby Convention Centre, Kuala Lumpur. In recognition of best IR practices by professionals and public-listed companies listed on Bursa Malaysia, MIRA engaged EXTEL to conduct the 7th Malaysian IR Survey. This is aimed at leveraging on EXTEL's survey database of investment professionals to participate in the Survey, which will be conducted between April 2017 and August 2017. Buy-side and sell-side professionals globally were invited to participate in the Survey. Only legitimate investment professionals investing in or covering Malaysia were included in the results. Investment professionals include those from asset management firms (of any proper type; long only, Sovereign Wealth Funds (SWFs), wealth managers, private equity and hedge funds) and brokerage houses or equity research providers.